Argan trees are short, thorny, and gnarled, and although they can live for 250 years they never reach impressive heights due to their slow growth pattern. They are endemic to Morocco and northern Africa, surviving in incredibly harsh conditions where few other trees can. For people, the real value of the trees lies in their fruit – or more accurately, the kernel inside. They produce a small fruit with an acorn sized nut inside, which falls from the tree in late summer. In order to get to the valuable kernel inside, the flesh of the fruit has to be removed, and the tough nut cracked open with a rock. It takes 30 kilograms (66 pounds) of argan fruit and 15 hours of labor to make just a single liter of oil. This is hard work, and traditionally it has been performed by Berber women. The local Berber people have known about the medicinal properties of the oil extracted from argan trees for centuries. It was used as a folk medicine for heart disease, rheumatism, and skin conditions, as well as a deliciously nutty food oil (although only in its raw form, as it doesn’t resist heat). 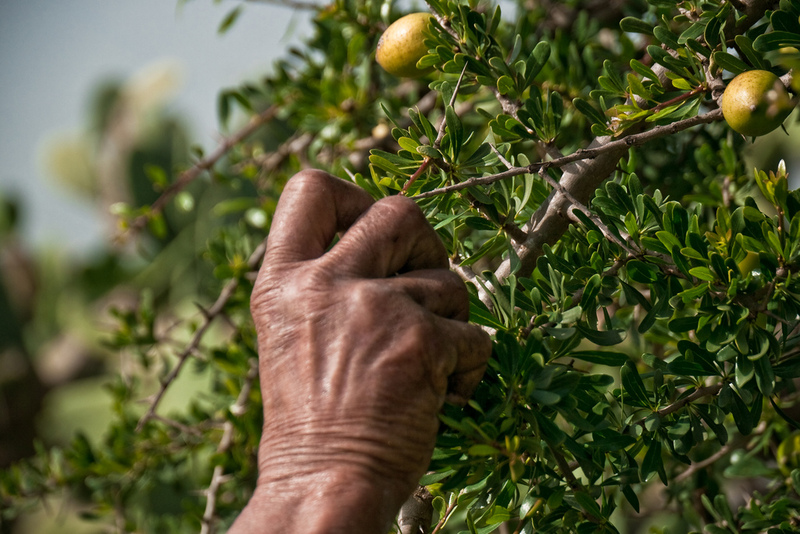 Because of the argan tree’s sharp thorns, removing the fruit from the tree is exceptionally difficult, and usually farmers waited for it to fall rather than risk a painful climb. Fortunately another staple of the region managed to lend a helping hand – goats. 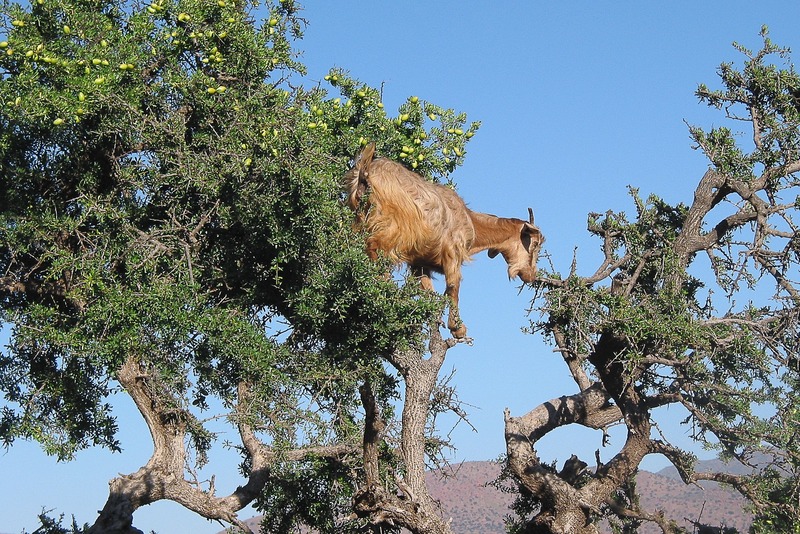 Goats are able to easily scale the short argan trees to feast on the leaves and fruit of the trees, and the sought after nut is left in tact. If it’s small enough to be digested it can be collected from droppings, and if not the goats are intelligent enough to spit it out and move on to the next meal. Many farmers even cut some of the lower branches to facilitate their climb. And so it continued for centuries. The trees were native to the area, so they didn’t need to be planted, and the goats played their part in propagating their seeds. As European markets began demanding imports of fruits and vegetables, local farmers began removing some of the abundant argan trees in order to plant tomatoes and other salad crops beneath plastic tarps. These greenhouses brought respectable income, but the number of hectares of argan trees greatly decreased each year throughout the 1970s and 1980s. 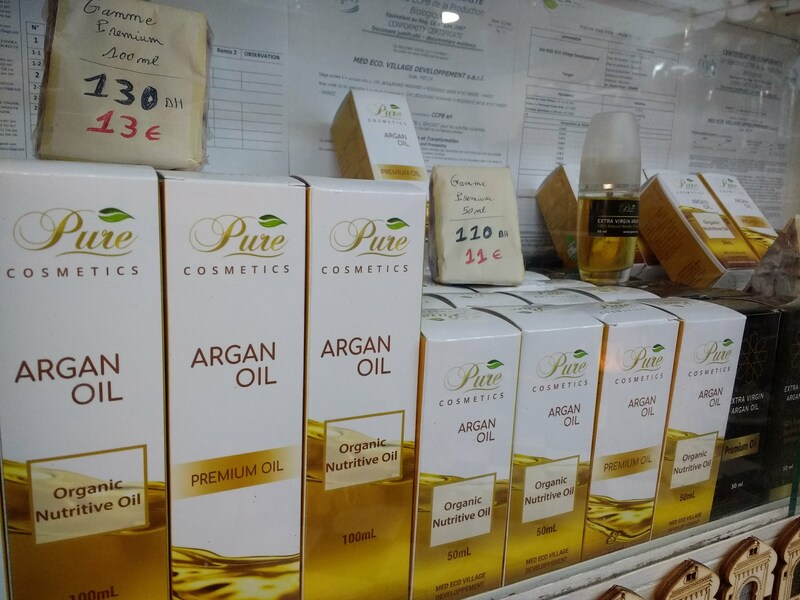 Eventually, the incredible benefits of argan oil became known to the outside world, and demand from the cosmetic industry in particularly made the value of the crops skyrocket. More scientific studies revealed that the oil is high in unsaturated fats, vitamin E, and has strong antioxidant effects that aid in the healing of skin tissue, lower bad cholesterol and raise good cholesterol among other benefits. Suddenly argan farmers had a huge increase in income, and Morocco’s economy as a whole boomed. As of 2016 the industry brought in more than $6.5 billion, with no signs of slowing down. Farmers, who had never really had to plant the trees, poured their income into another valuable resource: goats. 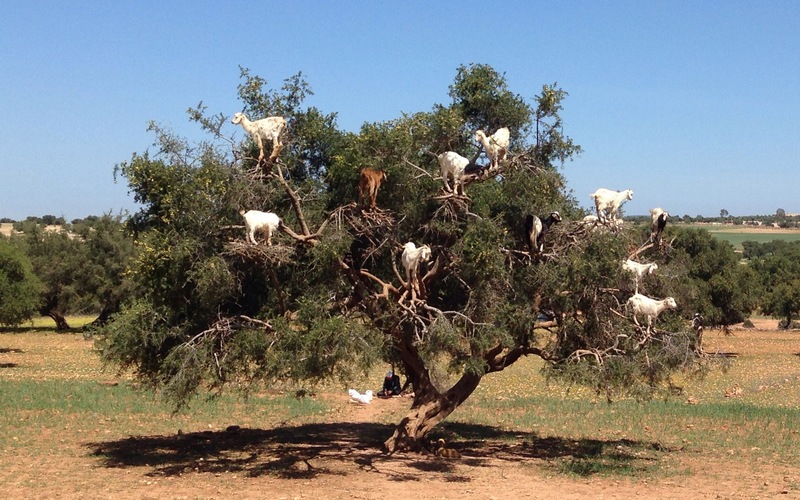 As the number of goats increased, the trees gained some international fame from the bizarre pictures taken by tourists of these short, wide trees with tens of goats perched perilously on their branches. While they are quite entertaining, the detrimental effects of overgrazing represented a much larger threat to the region than anyone understood until it was nearly too late. Although originally provided a natural way for argan trees to spread their seeds, as they grew more numerous they began consuming young argan sprouts before they ever got the chance to reach maturity, or ate so many leaves of adult trees that they could no longer survive. 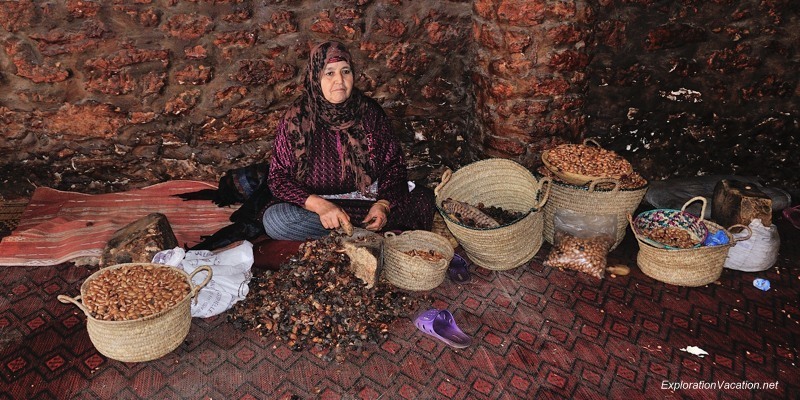 The loss of argan trees is much more than just an economic problem for Moroccans. The trees’ deep root systems also play a crucial role in preventing soil erosion. 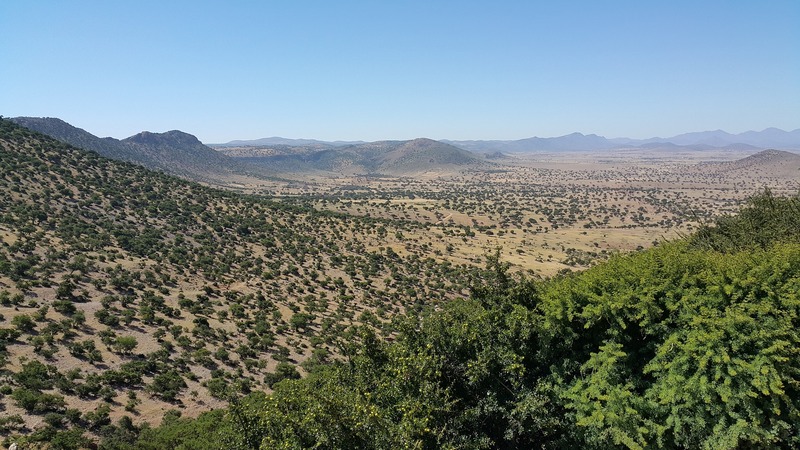 Without the trees, the entire region runs the risk of becoming an arid wasteland. UNESCO identified this threat and stepped in by declaring a large biosphere reserve in 1998. This did little to prevent overforaging as short term economic gains eclipsed environmental concerns for impoverished farmers, but it seems that that’s now starting to turn around. In the past few years the Moroccan government has been planning and executing an extensive plan to protect its valuable natural resource. New, sustainable methods of production are being implemented, which will not only protect the region from desertification, but also raise the incomes of millions of local people. An estimated 3 million hectares are suitable for argan orchards, a huge increase over the current 820,000 hectares. When economic and environmental incentives align, change can come incredibly swiftly. In this case, does it have the potential to returned the threatened species to levels even higher than experienced at their peak, while simultaneously building a greatly needed industry in a region where over 19% of the rural population lives in poverty. Truly a remarkable turnaround. If you enjoyed this article about argan trees, check out the archive for more tree stories. Also check out the Facebook page, with a few extra tree goodies throughout the week. Subscribe below to receive notifications whenever a new tree story is published. Yep! Actually it was the goats that got international attention before any health and beauty products. Pretty funny stuff! They do not even seem to care. but the goats know they are COOL and ELEGANT. Hahaha… I’ve read that they are considered a weed in Australia and parts of California. Maybe those areas just need more goats! I suspect that the rural population won’t reap the rewards as this will be developed to an industrial scale. Modern agriculture. Could be. It’s a huge increase of the number of hectares of trees, so it will provide some employment. Labor is cheap in that part of the world. At the very least their homes won’t be overcome by desertification. Time will tell!